Camurati-Engelmann disease is a rare bone disorder characterized by cortical thickening of the diaphysis of tubular bones, with sparing of the epiphysis. It has variable degrees of penetrance and expression, but may be very disabling for the affected individuals who manifest the painful symptoms. The age at which affected individuals first experience symptoms varies greatly; however, most people with this condition develop pain or weakness by adolescence. In some instances, people have the gene mutation that causes Camurati-Engelmann disease but never develop the characteristic features of this condition. Approximately 200 cases have been reported worldwide. People with this disease have increased bone density, particularly affecting the long bones of the arms and legs. In some cases, the skull and hip bones are also affected. The thickened bones can lead to pain in the arms and legs, a waddling walk, muscle weakness, occasionally anaemia and extreme tiredness. An increase in the density of the skull results in increased pressure on the brain and can cause a variety of neurological problems, including headaches, hearing loss, vision problems, dizziness (vertigo), ringing in the ears (tinnitus), and facial paralysis. The added pressure that thickened bones put on the muscular and skeletal systems can cause abnormal curvature of the spine (scoliosis), joint deformities (contractures), knock knees, and flat feet (pes planus). 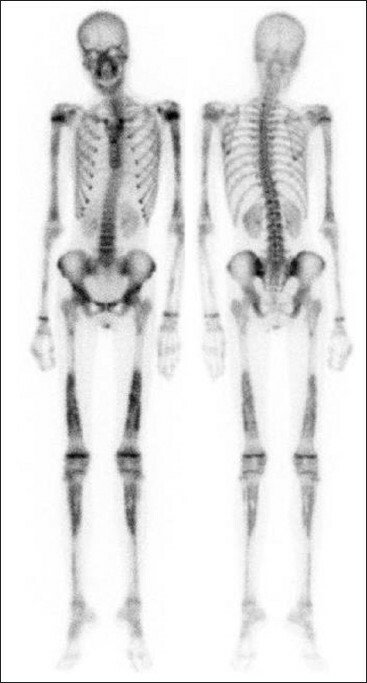 Other features of Camurati-Engelmann disease include abnormally long limbs in proportion to height, a decrease in muscle mass and body fat, and delayed puberty. Some patients are asymptomatic and they are diagnosed after radiological screening of relatives. Involvement of the bone is the most specific manifestation of the disease and radiological appearances usually form the basis for diagnosis. It is interesting that the patients’ symptoms abated on two occasions after biopsy of the bone. This apparent relationship between biopsy and remission may be due to a local effect of trauma in stimulating osteoclastic activity. Mutations in the TGFB1 gene cause Camurati-Engelmann disease. The TGFB1 gene provides instructions for producing a protein called transforming growth factor beta-1 (TGFβ-1). The TGFβ-1 protein helps control the growth and division (proliferation) of cells, the process by which cells mature to carry out specific functions (differentiation), cell movement (motility), and the self-destruction of cells (apoptosis). The TGFβ-1 protein is found throughout the body and plays a role in development before birth, the formation of blood vessels, the regulation of muscle tissue and body fat development, wound healing, and immune system function. TGFβ-1 is particularly abundant in tissues that make up the skeleton, where it helps regulate bone growth, and in the intricate lattice that forms in the spaces between cells (the extracellular matrix). Within cells, the TGFβ-1 protein is turned off (inactive) until it receives a chemical signal to become active. 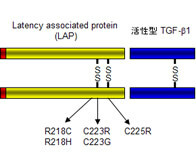 The TGFB1 gene mutations that cause Camurati-Engelmann disease result in the production of a TGFβ-1 protein that is always turned on (active). Overactive TGFβ-1 proteins lead to increased bone density and decreased body fat and muscle tissue, contributing to the signs and symptoms of Camurati-Engelmann disease. This condition is inherited in an autosomal dominant pattern, which means one copy of the altered gene in each cell is sufficient to cause the disorder. The majority of mutations in individuals with CED lead to single amino-acid substitutions in the carboxy terminus of TGF-β1 latency-associated peptide (LAP). The substitutions are near the site of interchain disulfide bonds between the LAP homodimers. These mutations disrupt dimerization of LAP, that is binding to active TGF-β1 leading to increased active TGF-β1 release from the cell. However, in a luciferase reporter assay specific for TGF-β1-induced transcriptional response, the mutant cells showed increased luciferase activity, suggesting intracellular activation of the receptor. Therefore the pathogenic mechanism underlying the sclerosing bone phenotype in CED patients is increased TGF-β1 signaling as a result of disturbed activation or secretion of the mutant protein. The experimental results suggest the existence of two distinct mechanisms leading to increased TGF-β1 activity in CED patients depending on the underlying mutation. In the first, represented by the R218C, H222D, and C225R mutations in exon 4 of TGFB1, secretion is normal, but the percentage active TGF-β1 is elevated. These mutations are located close to the two cysteine residues (Cys223and Cys225) that form the intrachain disulfide bonds. It is assumed that the resultant destabilization of the dimerization process would facilitate the activation of latent TGF-β1. In the second mechanism secretion is disturbed, leading to intracellular accumulation of TGF-β1. Some individuals with Camurati-Engelmann disease do not have identified mutations in the TGFB1 gene. In these cases, the cause of the condition is unknown. In some cases, an affected person inherits the mutation from one affected parent. Other cases result from new mutations in the gene and occur in people with no history of the disorder in their family. Corticosteroids and analgesics improve the quality of life, decrease the pain but do not alter the course of the disease. Camurati–Engelmann disease is partially treatable. Glucocorticosteroids, which are anti-inflammatory and immunosuppressive agents, are used in some cases. This form of medication helps in bone strength, however can have multiple side effects. In several reports, successful treatment with glucocoricosteroids was described, as certain side effects can benefit a person with CED. This drug helps with pain and fatigue as well as some correction of radiographic abnormalities can be observed. Alternative treatments such as massage, relaxation techniques (meditation, essential oils, spa baths, music therapy, etc. ), gentle stretching, and especially heat therapy have been successfully used to an extent in conjunction with pain medications. A majority of CED patients require some form of analgesics, muscle relaxant, and/or sleep inducing medication to manage the pain, specifically if experiencing frequent or severe 'flare-ups'.